Eighty-eight monkeys in a South American laboratory have been brought to the UK by a primate sanctuary. 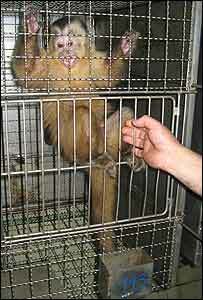 The Capuchin monkeys were removed from single cages in Santiago, Chile, by Monkey World. They will now be rehabilitated in specially designed houses at the sanctuary in Wareham, Dorset. Some of the primates - aged from two up to 30 - have spent 20 years in confinement, said a spokesperson for Monkey World. With a number of the primates having only been taken out of their cages for medical experiments, they will need to be rehabilitated at the sanctuary's Capuchin Lodge to encourage their natural instincts. This process could take weeks in some cases, but months in others. The laboratory asked for Monkey World's help and Dr Alison Cronin and her late husband Jim, who died from cancer last year, had been planning the operation for more than a year. Dr Cronin, who is director of Monkey World, said: "This is the largest rescue Monkey World has ever undertaken in its history and the largest rescue of primates in the world. "They have been confined in small laboratory cages and they are coming to us with lots of psychological and potentially medical problems. "The first day we walked into the laboratory we were met with shrieks and screams. "Within an hour or so they settled down. They realised we posed no threat to them." It took two days to transport the 88 capuchins in individual cages with windows, with help from the Chilean Air Force. The Chilean military Hercules transporter arrived at Bournemouth Airport on Tuesday evening with special permission from the UK government. Monkey World has already rescued more than 50 monkeys and apes from five different laboratories. Capuchins are omnivores who live in groups of around 35 in the wild in Central and South America and have a life-expectancy of more than 30 years.